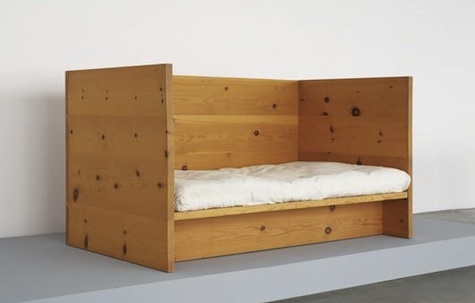 Paul Sermon, Telematic Embrace (1993): A series in which the artist projected images of reclining figures onto comfort furnature such as beds and couches. 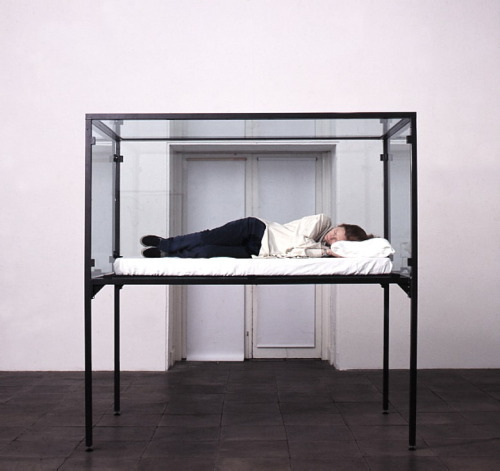 Sophie Calle, The Sleepers (1979): The artist asked friends to sleep in her bed in eight hour shifts. She documented their stay and noted "important" aspects of their visit, as well as what they ate that day. 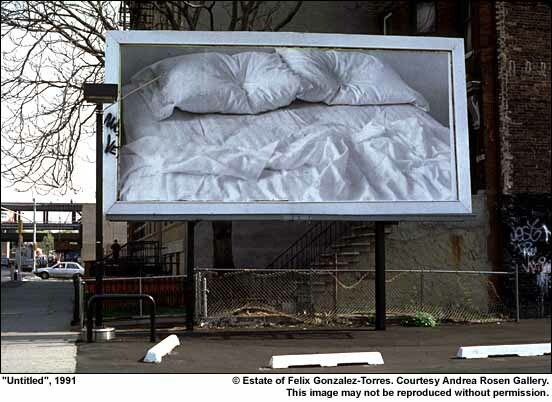 Felix Gonzalez-Torres, Untitled (1991): After his lover Ross passed away, the artist displayed images of an absent body mark imprint on the bed on billboards all over NYC in memory of his lost love. It was also a subtle reminder to those whose lives were cut short by AIDs (which later caused Gonzalez-Torres' life to end tragically short as well). 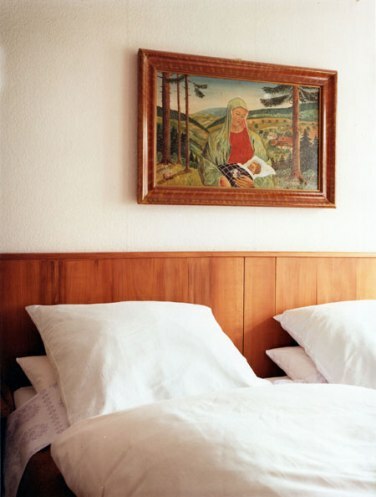 Tracey Emin, My Bed (1998): The artist displays her bed in a gallery as an art object, remniscent of earlier artists who tried to show formal composition from overlooked, banal, everyday objects. Andy Warhol, Sleep (1963): An infamous "film" in which documents Warhol's friend John Giorno, sleeping for 5 hours and 20 minutes.